Work on the Piece Hall and Halifax’s new Central Library and Archive has moved a step closer after the £25m contract for the construction work was advertised by Calderdale Council. The Grade 1 Listed Piece Hall will be restored and revitalised, creating a 21st Century heritage visitor attraction, harnessing the beauty and impact of the building with the addition of a state-of-the-art interpretation and learning centre, a new east extension and a re-designed courtyard. said Councillor Tim Swift, the Leader of Calderdale Council. The new Central Library and Archive has been designed to suit the varied needs of the community. Located on the former Square Church site it will enhance the Cultural Quarter around the Piece Hall, providing a flexible and attractive environment to learn and socialise. A single main contractor will be appointed to deliver both the transformation of the Piece Hall and build Halifax’s new Central Library to ensure best value and minimise disruption on-site during construction. The contract will be advertised Europe-wide, in line with public sector rules on purchasing. The Council will make sure, within these rules, that the project will bring social benefits to Calderdale, such as supporting local apprenticeships, and that the environmental impact of the project is kept to a minimum. The multi-million pound development should provide a welcome boost to the local economy. The Council is planning a supplier day so that local businesses can promote themselves to the successful contractor and find out more about the supply chain opportunities within this major regeneration of central Halifax. 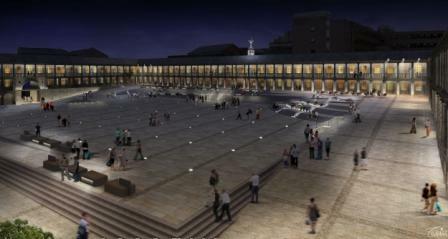 The Piece Hall project is being funded by Calderdale Council and a £7m grant from the Heritage Lottery Fund. The new Central Library and Archive will be wholly funded by the Council. The Piece Hall and new Central Library and Archive projects, the Arts Council-funded extension at Square Chapel and the MyPlace Orangebox Young Peoples Centre bring the total being invested in central Halifax to almost £40m. The Orangebox will open in September 2013. This entry was posted in All news, Libraries, Piece Hall. Bookmark the permalink.